The Federal Reserve Bank of Chicago (Chicago Fed) publishes a number of financial indices which provide insight into the direction of the macro economy. 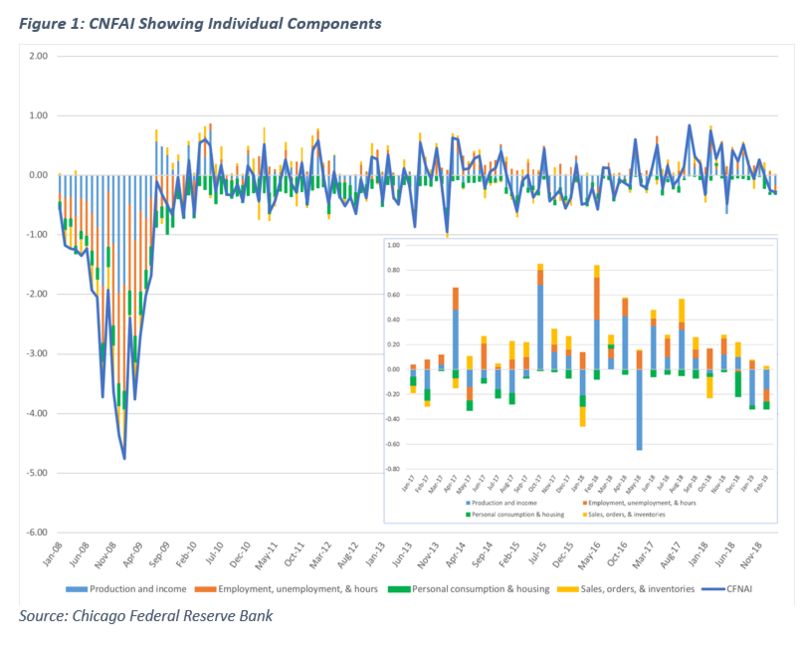 One of these is the Chicago Fed National Activity Index (CFNAI), which is a weighted average of 85 indicators of growth in national economic activity drawn from four broad categories of data: production and income; employment and hours; personal consumption and housing; and sales, orders, and inventories. The CFNAI scale centers on zero, which the Chicago Fed indicates is associated with the national economy expanding at its historical trend (i.e., average) rate of growth. Negative values (in standard deviation units) indicate below-average growth, while positive values are associated with above-average growth. The Chicago Fed publishes three different index values monthly: a monthly index (the CFNAI), its three-month moving average, and a diffusion index. Since monthly numbers are relatively volatile, the three-month moving average (the CFNAI-MA3) provides a more consistent picture of national economic growth. The third index figure, which is also a three month moving average, the CFNAI Diffusion Index, is designed to capture the degree to which a change in the monthly index is spread out among its 85 indicators. The Chicago Fed indicates that periods of economic expansion are historically associated with the CFNAI-MA3 being above –0.70 and the CFNAI Diffusion Index above –0.35, while periods of economic contraction have historically been associated with values of the CFNAI-MA3 and the CFNAI Diffusion Index falling below those levels. The indices also forecast inflation. Historically, there is an increased likelihood of sustained increasing inflation when values of the CFNAI-MA3 are above +0.70 more than two years into an economic expansion. Note that the highest reading of the CFNAI-MA3 has remained well below this level since the end of the 2007-09 recession. In the most recent release of the CFNAI, the primary index edged down slightly, going from -0.25 in January to –0.29 in February (see Figure 1). Two of the four broad categories of indicators that make up the index decreased from January, and three of the four categories made negative contributions to the index in February. 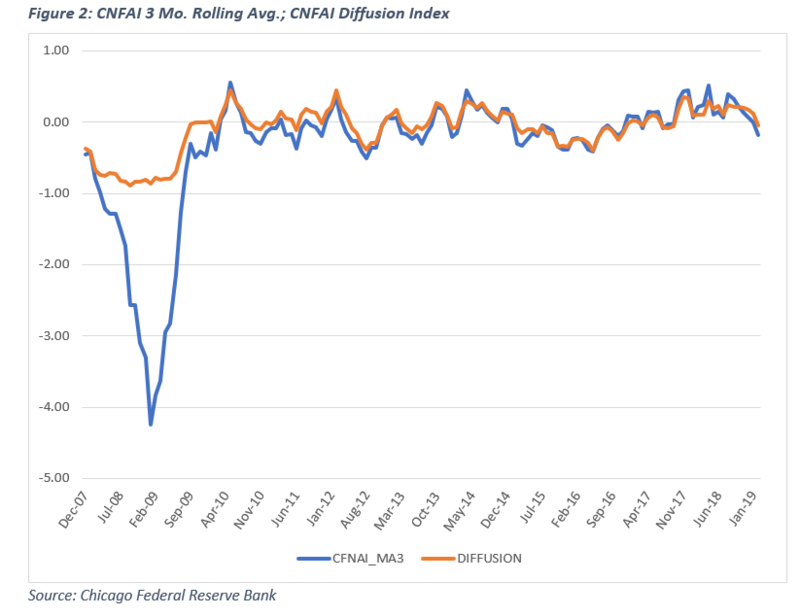 The index’s three-month moving average, CFNAI-MA3, moved down to –0.18 in February from a neutral reading in January, while the CFNAI Diffusion Index, which is also a three-month moving average, decreased to –0.05 in February from +0.12 in January (Figure 2). Thirty-eight of the 85 individual indicators made positive contributions to the CFNAI in February, while 47 made negative contributions. Thirty-seven indicators increased from January to February, while 48 indicators fell. Of the indicators that improved, 16 nevertheless remained negative. As noted, although the current figures are slightly negative, they are well above the level that is associated with an economic contraction and as shown in Figure X, the Diffusion index has not fallen below -.35 since mid-2012, and the CFNAI-MA3 has not fallen below that level since late 2015. For more information on the Chicago economic index programs, go to https://www.chicagofed.org/research/data/cfnai/current-data. The CNFAI scale is expressed in standard deviation units; i.e., a value of 1 indicates that the index is one standard deviation above or below historical growth trend.